Both BC Parks staff and the Stein Wardens worked together on a multi-day trip to improve the access, facilities, and general trail conditions along the main E-W traverse. The Stein Valley is free and open to all, as long as there are no commercial activities associated with use (i.e. guiding etc.). Please respect this beautiful backcountry wilderness area. As of June 27, 2017, the Stein Management Board has decided to close down the park to kayakers unless the interested party/company has a current Park Use Permit. This decision is to allow Lytton First Nation and BC Parks to investigate how the park is being used by this recreational group – and how to minimize negative impacts to all values within the park. This type of activity is subject to a fine under the Park, Conservancy, and Recreation Area Regulations. Stay tuned for possible changes to this decision. As of June 27, 2017, the Stein Management Board has decided that no campfires are allowed in the park year-round. This decision is based on the consistent illegal use of campfires throughout the park. Any individuals found to have started a campfire is subject to a fine under the Park, Conservancy, and Recreation Area Regulations. The cable car near Cottonwood Campground was removed in summer of 2017. Crossing of the river in this area will be via foot until an official walking bridge is installed – anticipated date: 2018/2019. August 2016: Cottonwood Forks Camp Bridge has been discovered as impassable. Cottonwood Creek is passable on foot during times of low water, which it is at this point (at approx. 50° 21’ 17.50”N / -122° 00’04.72”W on the Blowdown Pass). Otherwise, the Blowdown Pass route to the Stein Divide (at Cottonwood Falls) is impassable until the bridge is repaired. Please check this page for updates. This is a wilderness park containing spectacular scenery and outstanding historical, cultural and spiritual values. It protects the entire Stein River watershed. This is a user-maintained area, with 150 km of hiking trails and routes, four cable crossings, a suspension bridge and several wilderness campgrounds. The park offers limited opportunities for easy day hikes (primarily in the lower valley) and extensive opportunities for multi-night backpacking trips over moderate to difficult terrain. With limited Ranger and Stein Valley Warden patrols, visitors must be self-sufficient and prepared for all eventualities. For more information about Stein Valley landforms, the Stein River and its tributaries, visit this page: Stein Valley Landforms. Special Features: The park protects an intact watershed, in addition to preserving the First Nation’s history of the area. Park Size: 107,191 hectares. The Park boundary follows the watershed boundary for approximately 195 kilometres along a continuous line of summits and ridges. The Stein Wardens (Lytton First Nation members) and Park Rangers (with BC Parks) will be continuing to maintain the park and enhance the users’ experiences. Please obey any direction provided by them and adhere to the official signage throughout the park. BC Parks is requesting that all visitors to this park complete an online comment form so that management can obtain valuable information from those that have visited the park. Vehicles are not permitted in the park – access is only via hiking; no horses or mechanized access (4x4s, ATVs, mountain bikes, snowmobiles, helicopters, float-planes) are allowed. Dogs should not be brought into the Stein. They can harass wildlife (and other hikers) and bring you face-to-face with an angry bear. Grizzly bears and black bears roam throughout the park but are not often seen. Avoid encounters by making noise as you hike, and keeping your food and garbage in a food cache or hoisted up a tree. Sections of the trails may be closed due to natural hazards of wildlife, weather, and trail conditions. Visit our Stein Valley Trails and Routes page for more details. Do not underestimate the demands of hiking the full length of the valley. Routes out of the valley include steep ascents and descents and rugged terrain. Weather changes quickly here. You may experience sun, rain and snow all on the same day. Be prepared. Sudden storms can cause white-out conditions and necessitate travel by compass, particularly at higher elevations. Solid route-finding skills are a necessity. Rugged terrain and deadfalls across the trail can significantly lengthen the amount of travel time required. Allow extra time to complete your trip. Sections of some trails may be wet, steep or difficult to see. Bring appropriate footwear, a good map and compass and watch carefully for trail markers. In most locations of the park you will be several days from any form of help. Bring a good first aid kit and exercise caution. The Lytton Ferry provides access to the main Stein trailhead. For current information about the Lytton Ferry please check the Drive BC website (click on Inland Ferry, click on or scroll down to Lytton Ferry, then click on Current Conditions and Events). The ferry is usually closed for significant periods from late May to early July because of high water. As per much of the province, the Stein Valley Nlaka’pamux Heritage Park is extremely dry. Please take utmost caution if using any cooking appliances – suggestions would be to bring food with you that does not need any cooking/heating. Stein Valley Nlaka’pamux Heritage Park is an area of cultural significance. All values need to be conserved in their natural state as much as possible. It is suggested that visitors do not bring dogs in to the park, primarily because digging in to the soil etc. is a natural behaviour for most dogs. If visitors insist on bringing dogs in to the park, please keep them under control and discourage digging behaviour anywhere in the park (including the parking area). As with all protected areas, please clean up after your dog. Park Use Permit Applicants: The Stein Valley Nlaka’pamux Heritage Park is co-managed via a Stein Management Board between BC Parks and the Lytton First Nation (see their website at http://www.lyttonfirstnations.ca/). In order for a Park Use Permit application to be considered by BC Parks, the application must be reviewed and agreed upon by the Lytton First Nation prior to submission. If an application is received by BC Parks proof of discussions with the Lytton First Nation will be required as part of the application process. Learn about glaciers and glacier research. Preliminary efforts are underway to monitor glaciers within the Stein Valley Heritage Park. No open fires are allowed year-round in the park at this time. Please ensure you bring along appropriate equipment for cooking any meals. Do not touch or tamper with any pictographs, petroglyphs, or culturally modified trees. Contact between these artifacts and your fingers transfers oils and acids which damage them. In some cases these pictographs have existed for several thousand years. Please, join us in protecting them for future generations. It is an offence under the Park Act to damage or destroy any park resource, including cultural artifacts. The park lies west of Lytton and approx. 185 km southwest of Kamloops or 290 km northeast of Vancouver, both via the #1 Highway. 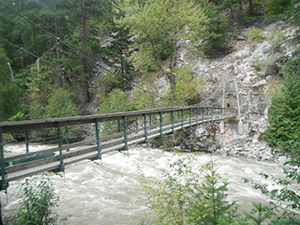 The main trail head is located on the west side of the Fraser River by Lytton, accessed by crossing the Lytton Ferry. After disembarking from the ferry, follow the road to the right for 4.8 kilometres to the junction with the Stein Valley Road (marked). Turn left and follow it to the parking lot. Alternative access to the main Stein Valley trailhead is available via the Westside Road south from Lillooet, on the west side of the Fraser River. This is a slow 2-3 hour drive on a rough dirt road. There is also a pedestrian walkway along the CN railway bridge that crosses the Fraser River south of Lytton. The trailhead is roughly 8 km north from the west end of the bridge. Other trailheads for accessing the park are located at Lizzie Lake, Blowdown Pass and Texas Creek. History: The park was established on November 22, 1995, following a 25 year debate over development versus protection. The name comes from the Nlaka’pamux word “Stagyn”, which means “hidden place”, referring to the fact that the valley and the extent of the watershed is not very noticeable from the Stein River’s mouth on the Fraser River. The valley has been extremely important to the Nlaka’pamux people for thousands of years, both spiritually and for sustenance. Since the establishment of the park the Stein is managed via the Stein Valley Co-Operative Management Agreement between the Lytton First Nation and the Province of BC – on the Stein Management Board. The function of the Management Board is to oversee and provide management direction for all initiatives and undertakings related to the planning, operation and management of the Park. This arrangement also provides the park with two seasonal full-time Wardens who assist both the users of the park as well as maintaining values within the park particularly in the lower Stein. Please ensure all your activities within the park are respectful and you practice a “leave no trace” philosophy. Conservation: The Stein Valley straddles the transition from the dry interior to the wetter Coastal Mountains. This, combined with the large elevational gradient, has resulted in very diverse vegetation communities within the park. Dry ponderosa pine forests characterize the lower valley, while Douglas fir is predominant in the mid-valley and hemlock, cedar, spruce and fir become predominant in the western end of the valley. Patches of cedar exist throughout the valley, even at the eastern end in moist, cool locations along creeks such as Stryen and Teaspoon. Floodplain forests along the river are dominated by black cottonwood mixed with aspen and birch. Higher elevations are noted for stands of Engelmann spruce and subalpine fir, and above those are white bark pine and alpine tundra. Spectacular flower blooms occur in the spring and summer, particularly at higher elevations. Wildlife: Due to its size and relative lack of disturbance, the park contains populations of many species of wildlife that indicate its relative health as wilderness. It is thought to contain over 50 species of mammals, including mountain goat, cougar, wolverine, black bear and grizzly bear. Bird species include golden eagles, sharp shinned hawks, barred owls, pigmy owls, white-tailed ptarmigan, pileated woodpeckers and rufous hummingbirds, as well as several species of chickadees, warblers and nuthatches. The Stein River contains dolly varden char, rainbow trout and Rocky Mountain whitefish, as well as steelhead trout, coho, pink and chinook salmon that return to the river at certain times of the year to spawn. The section of river below the suspension bridge is navigable by kayaks but is classified as grade V water and should only be attempted by expert kayakers. The Stein River is not suitable for canoeing due to its inaccessibility. There is salmon fishing in the Stein River. Stein Lake has been stocked in the past. The river and lakes are not known for good fishing. Anyone fishing or angling in British Columbia must have an appropriate licence. The Stein Valley offers a wide variety of hiking opportunities. Hunting is permitted only during lawful game hunting season. Check with Hunting & Trapping Regulations Synopsis for regulations. 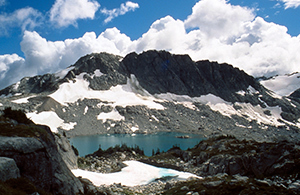 Backpacking in the alpine areas of the Stein offers the opportunity to view wildlife. Visitors have been known to ski tour the areas of Blowdown Pass and western park boundary areas. However, extreme caution should be exercised as these are isolated areas and subject to severe winter storms. Large groups (over four) need to contact the Thompson Southern Rivers staff of the BC Parks office in Kamloops during the planning phase for the Stein – please do not go until you coordinate with the BC Parks staff. This park has a limited carrying capacity (i.e. limited resources in small areas) and we need to minimize negative impacts to the environment and/or other backcountry campers. For planning purposes: campgrounds that are currently set up to accommodate larger groups include: Devil’s Staircase, Teepee, Suspension Bridge, and Cottonwood Creek. Please use the ‘Contact Us’ link on the webpage and/or call 250-371-6200 to discuss the Stein with the Thompson Southern Rivers staff with BC Parks. In the parking area at the trailhead there are 3 picnic tables provided for visitors day hiking in the area. There is one pit toilet that is user maintained. There is a large information shelter depicting the history, landforms and flora and fauna of the park. Each campground from the trailhead to Stein Camp has a user maintained pit or backcountry toilet. Visitors should bring their own toilet paper. Visitors should exercise proper backcountry sanitation procedures when no facilities are available. Deposit human waste in cat holes. Cat holes are 6 to 8 inches deep and should be located at least 100 feet from any water source. Thoroughly cover and disguise cat holes when finished. Bury toilet paper as well. Do not burn it. In the lower and mid valleys, there are 11 developed campgrounds. In the lower valley visitors must camp only at these sites. In the lower valley from the trailhead near Lytton to Cottonwood Cr. each campground has a pit toilet and a metal food cache. In the mid valley from Scudamore Cr. to Stein Camp, each campground has a rustic backcountry toilet and a metal food cache. Visitors must use the food caches provided. The incidence of bear/human conflict has greatly decreased with the use of the food caches. For visitor safety and to lessen the impact on the environment, a metal food cache and backcountry toilet have been installed at Brimful Lake. If you must camp where there is no food cache, use a rope cache, ensuring the food is 4 metres off the ground and 1 metre from the trunk. In other areas of the park where there are no developed campgrounds, please camp where your presence will have the least amount of impact on the environment. Or, camp where it is obvious others have camped. Visitors should ensure they are totally self-sufficient. The nearest amenities including pay phone is in Lytton. Due to the low snow levels in the Lytton area, there is opportunity for visitors to camp in the lower valley during the winter.